La Dama Sagrada - Zuercher & Co. This unpasteurized goat’s milk cheese is produced using Murciana goats’ milk in the Spanish Castilla-La Mancha region. Known for producing butterfat-rich milk, these Murciana goats belong to a cooperative of farmers in central Spain. The farmers are also members of the dairy, Señorio de la Mancha, contributing to the production of the cheese. La Dama Sagrada (“The Sacred Lady”) is aged for a minimum of 6 months, at which point the cheese displays its most desirable flavors. The texture of the paste is smooth and creamy with a bit of tyrosine crystallization throughout. 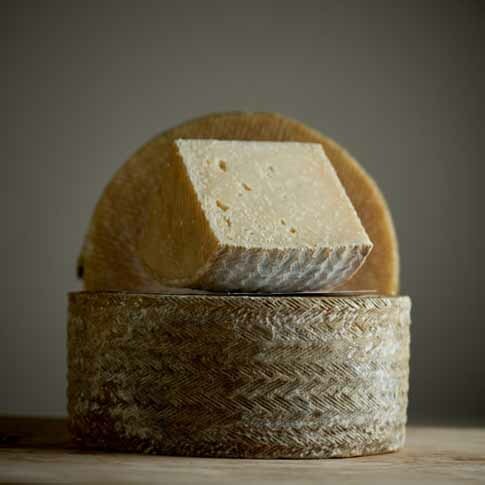 La Dama Sagrada has tangy and nutty notes with a faint barnyard finish that goat cheese lovers appreciate. Try doing as the Castilians do – pan-fry La Dama Sagrada, and serve with a bit of jam or marmalade.